Jessica and Samantha are back again to help you wade through the ocean of gear to help you find the best, most reliable, safest and most convenient gear to help to brave the winter cold and make your life with a toddler in the chilly winter months as easy as possible. Now that you’ve survived baby gear with Lady and the Blog’s A New Mom’s Ultimate Baby Gear Guide Part I, Part II, Part III, Part IV and Part V, it’s time to tackle the must-have toddler gear to make your life as a mom of an active toddler as easy and fun as possible. Previously we brought you A New Mom’s Ultimate Toddler Gear Guide, Part I: Eat, Sleep & Play and A New Mom’s Ultimate Toddler Gear Guide, Part II: Stroll & Travel. Now it’s time to hit the road and tackle the must-have toddler gear to make your strolling, playing, eating and traveling in the winter months a snap. Plum Organics is at it again — their newest addition to their organic and delicious line of baby and toddler food is their new Meatballs, and they’ve arrive just in time for the chilly days of winter. Plum Organics Meatballs come in three delicious flavors: teriyaki beef bites, italian style turkey bites and garden chicken bites so there’s something for the pickiest of toddler palates. The meatballs are frozen and fully cooked so you simply have to heat and eat and they are packed full of protein, whole grains, and organic veggies so you will be as excited to give them to your toddler as they are to eat it. As with all Plum Organics products, there are no genetically modified ingredients and no added preservatives or artificial flavors and the meatballs are made with vegetarian fed meat raised without hormones or antibiotics. The Plum Organics Meatballs retail for $4.49 at Target stores. Why We Love It: Chilly days inside mean everyone is craving hot, hearty meals and these delicious and healthy meatballs certainly fit the bill. As a bonus, these meatballs are easy to prepare, great for your little one and delicious — what’s not to love? Visit Plum Organics online to grab this delicious and nutritious mealtime must-have to keep little bellies full on cold winter days or visit them on Twitter, Facebook or Pinterest. My son and I are constantly on the go, and often a stroller isn’t the most practical solution especially when we are hopping on the subway. Enter the incredibly user friendly, Cybex 2.Go Carrier. However, as much as I have loved testing out my Cybex 2.Go Carrier in the beautiful summer months, it will become indispensable as the temperature drops and I want to make sure my little guy is warm and secure when we venture out on cold days. Keeping my little guy close means that we can snuggle together and keep each other warm (see our next must-have gear item below!). Rain or shine, the Cybex carrier is my favorite baby carrier on the market. Suitable from 3 months and with five different carry positions, the 2.Go Carrier is incredibly easy to adjust while the baby is in the carrier and with the extra wide belts and soft padding that make sure that my son’s weight is distributed on me evenly I am as comfortable carrying him as he is being carried. As a bonus, the 2.Go Carrier is so easy to adjust that I can switch my son from the facing out position to the facing inward position in a snap when it’s time for a nap on the run. The Cybex 2.Go carrier comes in three colors and retails for $129.00. Why We Love It: Incredibly user-friendly with a sleek look for mom, this is a must have accessory for a mom and little one on the go. Visit Cybex online for a hand-free way to keep your little one close while on the go or visit them online on Twitter, Facebook, Instagram and Pinterest. When it comes to keeping your little one warm when on the go, this zip up baby carrier cover does it all. Designed as a poncho, the 7AM Enfant Pookie Poncho goes around your little one from head to foot like a cozy sleeping bag open at the back and quickly and easily attaches to your carrier with velcro straps. Once on, the Pookie Poncho protects your baby or toddler’s head, back, shoulders and body from the cold. Baby or toddler wants to face in? No problem! The hood unzips to unveil a second internal hood designed for the facing-inward position. Amazingly, the Pookie Poncho’s versatility doesn’t stop there, the unique Pookie Poncho design means that this bundle of warmness also works on car seats and strollers. This is a life saver when we travel during chilly winter months with bags already bursting at the seams, because we can pack one piece of gear that works across all of our modes of kiddo transportation. The 7AM Enfant Pookie Poncho comes in 5 fabulous hues and retails for $118.00. Why We Love it: Easy to take on and off, easy to move across the carrier, stroller and car seat and unbelievably warm for your little one, this is a winter must-have for any baby-wearing mom (or dad!). Visit 7AM Enfant online to keep your little one cozy or safe in their car seat on chilly winter days or visit them online on Twitter, Facebook, Instagram and Pinterest. As versatile as a double stroller can get, the Joovy CocoonX2 is also a jogger and bicycle trailer in one. Perfect for active families, it is constructed of quality components, offering plenty of storage space, and holds up to two children with a max weight capacity of 100 lbs. With dual rear brakes, reflectors for nighttime safety, and a compact fold, this double stroller is as state-of-the-art as its design is unique. Another great perk– the Joovy CocoonX2 fits through standard width doors, ensuring that your adventure can begin as soon as possible. The Joovy CocoonX2 retails for $549.00. Why We Love It: The Joovy CocoonX2 is an enclosed stroller with a zip open/close mesh window, protecting up to two little ones from the harsh winter winds. Like a fun mobile fort for kids, it also keeps active moms and dads on the go with the kids, no matter the climate! Visit Joovy online to keep your little one dry and warm even on the snowiest of days or visit them online on Twitter, Facebook, Instagram and Pinterest. Skip Hop products have made an appearance in many of our previous Gear Guides and for good reason, the company continually produces quality, innovative products designed to make parent’s lives easier and their new Stroll & Go Three-Season Footmuff is no exception. The Skip Hop footmuff has a windproof and waterproof outer shell built around a fleece-lined adjustable collar and zip-open hood. Additionally, the footmuff has a snap-on winter layer for extra warmth making it a true three-season stroller accessory. These major features are paired with several more minor features that rate high on the practical scale including a non-slip backing to help it stay put, footmuff bottom that unzips to keep dirty shoes outside the footmuff and a zippered pocket with a toy ring. All of these features add up to one must-have piece of gear to keep your little one cozy and content as the weather fluctuates. The Skip Hop Stroll & Go Three-Season Footmuff is available in infant and toddler sizes and two colors and retails for $80. Why We Love it: Packed with practical features like the ability to adjust from crisp fall days to freezing winter months, this is a must-have stroller accessory from fall through spring. Visit Skip Hop online to keep your little one cozy all winter long or visit them online on Twitter, Facebook, Instagram or Pinterest. Babies have lots of gear to keep them dry on rainy or snowy days around town but what about mom? The Mumbrella is the must have stroller accessory for keeping mom as dry and happy as you keep your little one. The Mumbrella is a fully adjustable umbrella that attaches to your stroller to give you a hand-free umbrella solution so you can keep both hands free for maneuvering your stroller, handing out snacks or whatever needs arise while out and about on rainy or snowy days. The Mumbrella is water resistant and has a 50UV coating for sunny days making it a must-have stroller accessory rain or shine. On a particularly rainy day, I took my Mumbrella out for a spin and was thrilled that I ended the walk as dry as I had started. My favorite feature of the Mumbrella is how easy it is to push the button on the handle to collapse the canopy against the side of your stroller meaning that you do not need to detach the Mumbrella each time you want to go into a building which makes a BIG difference when running errands and popping in and out of stores and classes. Picture above, left is the Mumbrella attached to my stroller in the “up” position and above, right the Mumbrella is pictured in the “down” position achieved with the push of a button. The Mumbrella comes in three colors and retails for $39.99. Why We Love it: Easy to attach, easy to deploy and effective at hand-free umbrella coverage that will keep you dry as you run around town, what more could you ask for? Visit Mumbrella online to keep yourself dry on rainy and snowy days or visit them online on Instagram. One of the biggest winter safety hazards is puffy winter jackets worn in the car seat that inhibit the car seat’s ability to protect your little one in the event of a crash. Enter the 7AM Enfant Easy Cover to keep your little one warm on car trips while still keeping them safe. Designed in conjunction with the Car Seat Lady, the Easy Cover features front sleeves to keep your little one covered from head to toe while leaving hands and arms free for snack, playing or clapping along to their favorite song on the radio. The open back design reduces bulkiness so car seat straps can perform at maximum efficiency to keep your child safe without sacrificing warmth or comfort. The 7AM Enfant Easy Cover comes in three colors and retails for $59. A quilted version is also available in five colors for $69. Why We Love it: Safety and warmth intersect with this easy to use car seat accessory that can also pull double duty to keep your little one warm at sporting events or wherever your winter adventures take you. For long winter days inside with a toddler, great toys are a must and the Lego Duplo “My First” series is the perfect toy to keep your toddler occupied and entertained. The chunky bricks make Duplo “My First” series the ideal introduction to construction based play and the large Duplo brick size are perfect for small hands. The brightly colored, easy to build sets are a great way to learn about colors, animal sounds, names of fruits and more. As a bonus, the role play themes of the “My First” sets encourage role play scenarios to help your little one develop their imagination. The result is an educational toy that toddlers love and will play with again and again to help you keep your wits during the long winter months. Lego Duplo My First Farm (pictured above, right) retails for $19.99 and My First Tractor (pictured above, left) retails for $14.99. Why We Love It: Legos and Duplos are a classic toy for a reason, they provide hours of imagination based entertainment for kids of all ages and are a must-have tool in any mom’s arsenal for long winter days stuck inside. Visit Lego online to keep your little on happy and entertained for long winter days inside or visit them online on Twitter, Facebook, Instagram and Pinterest. Available in white/pastel and natural/primary colors, the Honey-Can-Do Kids Toy Organizer and Storage Bins is handy and versatile, making it an absolute must for life with little ones. Supporting four rows and twelve heavy duty plastic bins of varying sizes, organization is made easy with this customizable youth storage system. Rounded safety corners ensure that toddlers can play, have fun, clean up, all without hazardous edges. 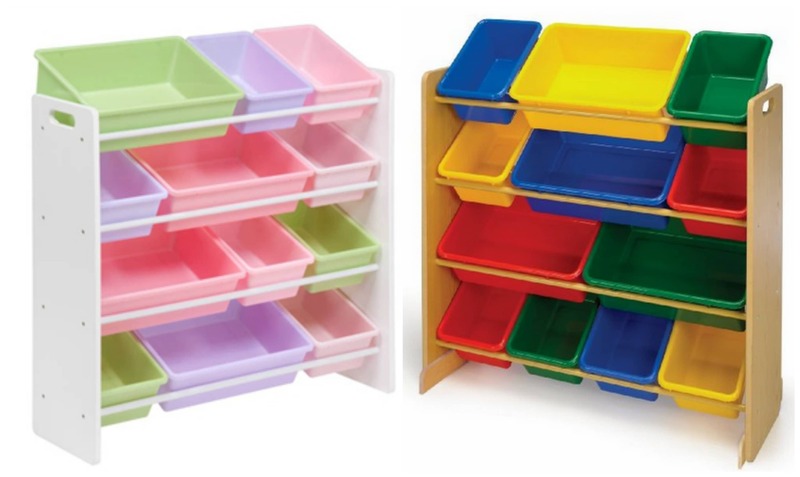 The Honey-Can-Do Kids Toy Organizer and Storage Bins retails for $133.99. Why We Love It: Great for odds and ends, toys, crafts, and more, the Honey-Can-Do Kids Toy Organizer and Storage Bins has endless potential. A must-have for the winter, keep a set by the door for kids gloves, hats, scarves, boots and shoes, and lost winter accessories will be a distant memory, as will filth from inclement weather in the household. 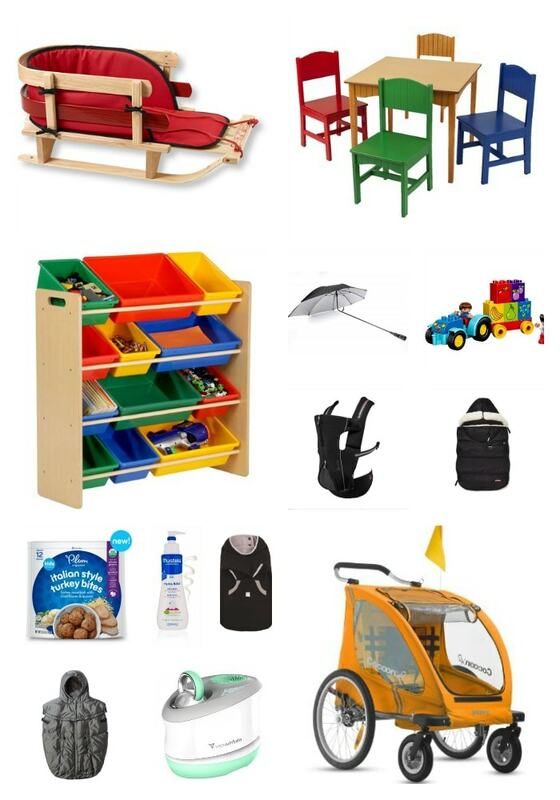 Visit Honey-Can-Do online for the ultimate toy storage solution. A beautifully crafted wooden table with four chairs, the Kidkraft Nantucket collection is available in color schemes well suited for any style. Among the sturdiest table and chairs yet we’ve seen for children, the set is also safety conscious, using only non-toxic paint in its construction. The set makes a beautiful addition in the home, especially during those cold winter months when indoor activities need to keep the attention of toddlers and small children. 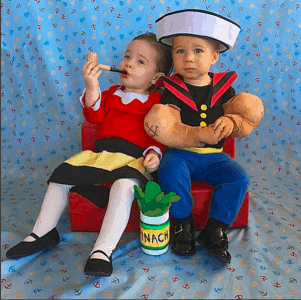 Prices for the Kidkraft Nantucket Table and Chairs may vary by retailer. Why We Love It: The perfect set for indoor activities both functionally and aesthetically, it is also a must-have for holiday gatherings, going above and beyond tea parties and coloring, it makes a great kids table for meals when company is over. Visit Kidkraft online to set your little ones up for indoor play fun during the chilly winter months or visit them online on Twitter, Facebook and Pinterest. The Vornadobaby Huey is the gold standard for little ones in humidifiers, giving off no mist, no mess, and no white dust. Producing a fine mist using invisible, natural evaporation to humidify all the air around baby, the Huey gently distributes the perfect amount of humidity throughout the room, combating the effects of dry heaters in the cold winter, which wreak havoc on sensitive baby skin. The Vornadobaby Huey retails for $109.99. Why We Love it: Adjustable settings, easy refill system, no pinch points or sharp edges, and lockable controls, are just some of the many reasons we adore the Vornadobaby Huey. Combining their expertise in vortex air circulation and the integrative knowledge that toddlers get into absolutely everything, this product is a real life-saver in the winter, and year-round. Visit Vornadobaby online to keep your little one hydrated and happy or visit them online on Facebook. Gentle on precious baby skin, but tough on harsh cold and dry conditions, Mustela products have been a reliable source of protection in the winter and year-round. For delicate babies and toddlers, the complete bath collection including the rich and creamy 2-in-1 Hair and Body Wash and the gentle Bath Oil are must-haves, cleansing and nourishing precious ones, with soap-free components that don’t sting the eyes. The Cold Cream with Nutri-Protective and Hydra-Stick with Cold Cream Nutri-Protective complete the hydrating experience, keeping baby’s skin soft against the dry indoor heat and cold outdoor winds. Mustela products retail for $9.50-11.50. Why We Love It: Using mostly natural ingredients, as well neutral pH (so it won’t sting the eyes), we feel safe with Mustela keeping our young ones clean and cozy. The moisturizing cold creams are also a must for dry and sensitive skin, from head to toe! Visit Mustela online to keep your skin happy and hydrated all winter long or visit them online on Twitter, Facebook, Instagram and Pinterest. The exquisitely crafted hardwood sleds from L.L.Bean have been celebrated for decades as they are built to last for generations. Created with quality in mind, the L.L.Bean Kids’ Pull Sled and Cushion Set is as functional as it is beautiful. Pull it through the woods, send it down a hill in the snow– this sleigh is made for fun winter memories that can be passed down as an heirloom in your family. Available in small or large, there are comfortable options that make it just right for your family. The L.L.Bean Kids’ Pull Sled and Cushion Set retails for $149-169 depending on size. Why We Love it: Is there a better prop for the family photo/holiday greeting card this year? We think not! Adorable and fun, this is one we’ll want to keep in the family to watch our grandchildren and even great grandchildren enjoy. Visit L.L.Bean online to get the must have addition to your holiday photos or visit them online on Twitter, Facebook or Pinterest. A New Mom’s Ultimate Toddler Gear Guide, Part II: Stroll & Travel.